This modern, architecturally uninspired hotel is centrally located just off O'Connell Street and offers comfort at an affordable, slightly unfashionable-neighborhood price. It's large but family-run, and still has a hospitable vibe and competent staff. It's very close to the airport bus stop, too. Rooms are not large - although the beds are - but feel polished and contemporary enough, if a little anonymous and beige (literally - there are some red cushions but the main theme is beige). Bathrooms, again, are small, but clean. YOU SHOULD KNOW We aren't kidding when we say the bathrooms are small - in some you have to close the door before you can reach the toilet. The bright lobby area, with purple velvet chairs, feels welcoming and bustling, and staff are very acommodating. There's a small ground floor fitness room, with running machines and some cardio equipment. Keys are available at reception. Breakfast is served in Oscars Restaurant, and offers a reasonable selection and hot cooked Irish breakfast. Plaza Bar and Grill offers Irish pub classics. If your room does not include breakfast, it's cheaper to pre-order at reception than to pay on the day. As well as reasonable food selections, Plaza isn't a bad option for a nightcap, with a weekly cocktail selection. The hotel is on the less popular side of the River Liffey, but that means you can get a good deal and (usually) a quieter night. Almost everything is still within easy walking distance. The fantastic Chapter One (4-minute walk), a one Michelin-star affair, is located in the basement of the Dublin Writers Museum. Or try the simple, wholesome Winding Stair (11-minute walk), a pleasant Irish restaurant overlooking the River Liffey with a bookshop downstairs. The Church (9-minute walk) is a great conversion of a former church, with outside space too. If you're in Dublin while any big sporting event is on, you are steps away from one of its liveliest sports bars, The Living Room (1-minute walk), with a huge TV. Or try The Celt (8-minute walk) for a traditional Irish boozer, with live music every night. 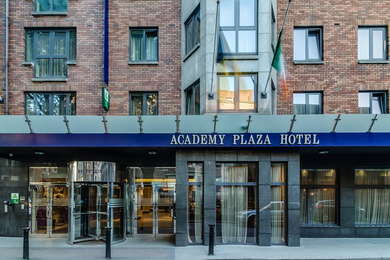 Reliable comfort at a good price - particularly for early, direct bookings - is a harder ask than it should be in Dublin, and so the Academy Plaza squeaks into our list because it delivers on both.